The Sandia mountains are the big landscape feature in Albuquerque, and every day when the sun sets, the mountains turn a lovely shade of pink for a short while. However the mountains offer more than stunning views. At Sandia peak, a 45-minute drive or short tram ride from central Albuquerque, you can ski, hike, and participate in several other outdoor activities, depending on the time of year. Here is our complete guide to this popular peak, including how to get there, what to do, and more. 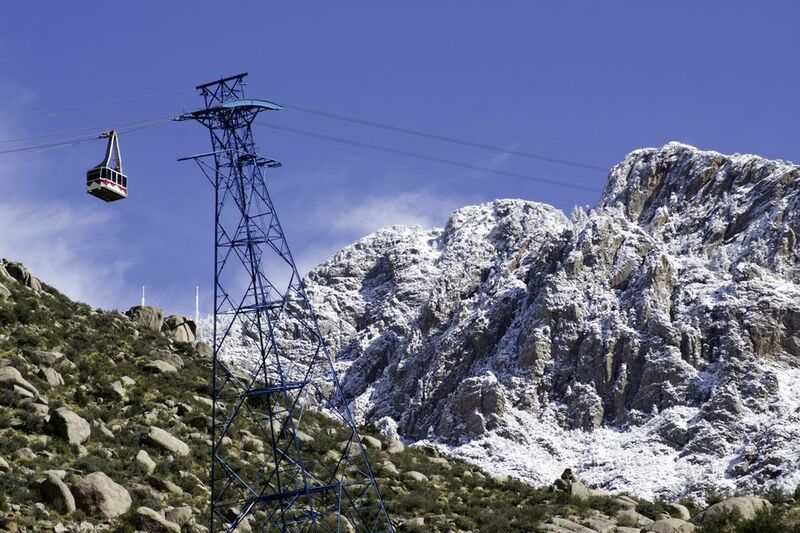 The most popular reasons to visit Sandia Peak in the winter are to ski and snowboard. Drive around the back of the mountain to find parking. You'll be right next to the Double Eagle II Day Lodge ski base where you will be able to rent ski and snowboard equipment and access the beginner slopes and ski school. If you're a more advanced skier, you can head straight to the tram directly to the top of chair lift 1. There are runs for skiers of all skill levels, but be aware that the base area elevation is at 8,700 feet, and the peak elevation is around 10,300 feet. Because of the high altitude, combined with the cold weather, expect to tire easily and be wary of altitude sickness. If you'd like to experience Sandia's forests, and are willing to pay a bit more for the opportunity, you can also take a snowshoeing trek with MST Adventures. Tours include snowshoes, poles, and a knowledgeable guide who can tell you about some of the sights and sounds you will see and hear. Tours last between 3.5 and 4 hours. Group tours of three or more people cost $85 per person, and private tours are $150 per person. Your guide will pick you up from a predesignated meeting place in the city and drive you to and from mountain. You can rent gear (including skis, snowboards, boots, poles, helmets, and more) from the ski base or from Sports Systems, a local store. Check with each location for current pricing and availability. During the summer and fall, the ski trails transform into mountain bike trails. You can rent a bike and helmet on site with a $650 rental deposit for the bike, $12 helmet rental and $35 deposit for the helmet. An all-day mountain bike package (includes bike and all day lift ticket) costs $60. A mountain bike rental with one roundtrip lift ticket costs $50. You can also head up to Sandia and have a picnic, enjoy a meal at Double Eagle II cafe, or even play a game of volleyball. During the fall, visitors can ride the chairlift to get scenic, aerial views of the changing leaves. However construction of the Top of Tram restaurant will disrupt all summer activities, including biking, until it's completed, likely by June 2019. There are two (soon to be three) restaurants on the mountain. At the base of the Sandia Peak Aerial Tramway, right next to where you'd enter the tram, is Sandiago's Grill at the Tram. The large windows in the restaurant offer stunning views of the valley below. You can get small bites, drinks, or a full meal before or after your time on the mountain. As an added incentive, a roundtrip tram ticket gets you $5 off a lunch or dinner purchase of $25 or more. If you'd like a bite to eat while hitting the slopes, visit Double Eagle II Cafe on the second floor of the ski base for snacks, breakfast, or lunch. In spring/early summer 2019, the new and improved Sandia Restaurant atop the Tram is scheduled to open. The facility will offer sweeping views of Albuquerque from 10,378 feet in the air. There are two main ways to get to Sandia Peak: by car or the tramway, though you'll also need a car to get to the tramway base terminal. If you're traveling by car and are trying to get to the ski area from Albuquerque, take I-40 East to exit 175 then drive north on NM Highway 14 to the Crest Scenic Byway 536. Stay on the byway for 6 miles and then you'll be at the ski area. If you're driving to the tram on I-40, take exit 167 and drive on Tramway Boulevard North for around 9 miles to the tramway base. From I-25 take exit 234 and follow Tramway Road east to the tramway. Where Can You Find Snowshoeing Near Albuquerque?